This spacious and sunny 2,500 square foot beach home, just steps from the beach, has everything you need to create memories to last a lifetime. Enjoy time on a romantic getaway, or with friends and family and still have plenty of privacy when you want it. There are two upstairs master bedroom suites. The South Suite has a king bed, vaulted ceilings, ensuite with a jetted tub. The North Suite has a queen bed and a single daybed, and ensuite. Both bedroom suites have flat screen TVs and private decks with spectacular ocean and island views. On the main level is a third bedroom with a queen sized bed. There is another full bath with washer and dryer also on the main level. There's a cozy living room with a leather (sleeper) sofa and a very cozy sun room , both great for relaxing and enjoying the sunset or watching the 48" flat screen TV. This is one of the very few Anderson Island homes with Wi-Fi and Direct TV. The fully equipped kitchen, kitchen bar and dining area open to the huge entertainment deck. On the deck you'll find a hot tub, propane grill, propane fire table and a complete set of patio furniture so you can enjoy the spectacular view to the fullest. Just a few steps to the beach where you'll have 3 kayaks and 2 stand up paddle boards at your service at no additional charge. The calm waters of Oro Bay make for some of the smoothest paddling you'll find anywhere. A short paddle across the bay brings you to Jacobs Point Park Marine Reserve with 82 acres of natural habitat and over a mile of pristine, undisturbed beach. This is the largest natural reserve in the entire Puget Sound. Expect to see our resident seals, heron, deer and eagles. More experienced paddlers can circle the island or head for nearby Ketron Island. If you're lucky you'll see the Orca and Humpback whales that frequently visit southern Puget Sound. If you'd like to bring your own boat we have a buoy right in front of the house and a boat launch just a few minutes away. Whatever you like to do, Anderson Island is a great place to do it. Many of our guests enjoy all the natural beauty of the Puget Sound right from the air-conditioned comfort of our home. If you feel more adventurous, there's lots to do on island. Golf at the Riviera Golf course and enjoy meals or drinks at the clubhouse restaurant overlooking Lake Josephine. Hike or bike the many parks and trials including Andy's Marine Park. Explore the many beaches of the island shores, bays and coves. Visit our local historical museum. Swim and fish in one of our 3 fresh water lakes including our famous "Old Swimming Hole" or take in a yoga class at our local studio. If you'd like to venture to the mainland, you'll find some great shops, restaurants, and spas in historical town of Steilacoom, all within walking distance of the mainland ferry dock. The Chambers Bay Golf Course, site of the 2015 U.S. Open, is just a few minutes drive from the Steilacoom ferry dock. Born and raised in the Pacific Northwest. My wife is an avid reader, movie buff and political "junky". I'm a musician and can bore you to tears rambling on about my favorite music. After much world travel, we think the Pacific Northwest is one of the most beautiful places on earth. After living in the Pacific Northwest most of our lives we recently discovered the South Puget Sound islands. We fell in love with the hidden islands and their secret inlets. Anderson Island quickly became one of our favorites. It has the perfect combination of secluded natural beauty and just enough modern conveniences to make the perfect place to relax and enjoy all the Northwest has to offer. Conveniently located and just about 90 minutes from Seattle. We love our Anderson Island home! 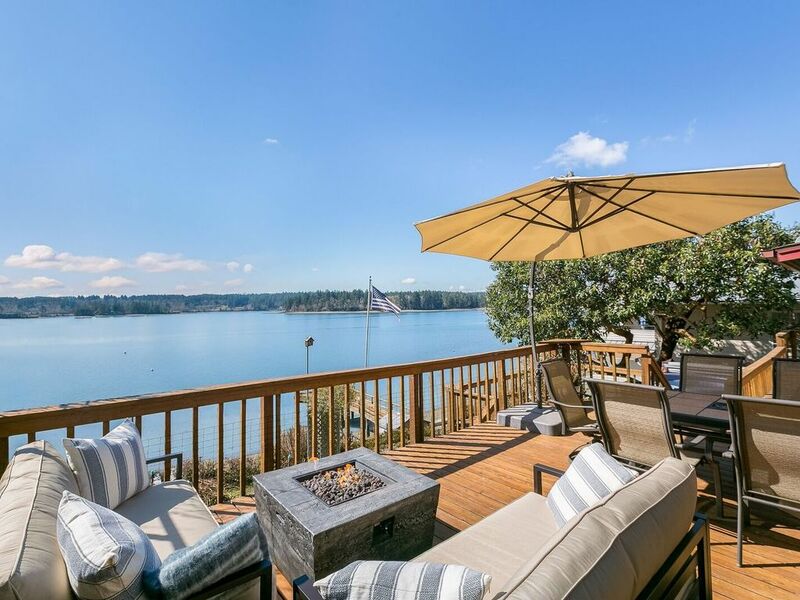 The house is located on the beach right on the shore of East Oro Bay with the calmest waters on Anderson island, ideal for swimming, paddling and boating. Beautiful water and sunset views from the deck, bedrooms, lounge and hot tub. Great year round for a romantic getaway or family vacation. toilet, tub, shower, jetted tub, Heated floors, walk in closet. Anderson Island is fairly remote. There's lots of great things to do very close by, but at the beach you'll feel very secluded. You are right on the beach, just steps away. You can see the mountains to the south. The house is right on Oro Bay in Puget Sound. Forced air heating throughout house. Large couch, big flat screen smart TV. We provide salt, pepper, spices. Complete dishes, glasses and utensils for 12. Seats 5 at table and 3 at the bar, plus plenty of seating on the deck if you'd like to enjoy meals outside. Large HD flat screen TVs in living room and both Master Suites. Both Master Suite and upstairs bedroom have private deck/balconies. We supply 2 Stand Up Paddle Boards, 2 single kayaks and one double kayak with life jackets and paddles, on site at no additional charge. Please bring your own life jackets for children under 6. Propane fire table, lots of nice patio furniture, large umbrellas. We supply 2 Stand Up Paddle Boards, 2 single kayaks and one double kayak with life jackets and paddles, on site at no additional charge. Tennis courts are available on island. 9 hole golf course at Riviera Country Club on Anderson Island just a few minutes away. 18 hole Fort Steilacoom Golf Course and Chambers Bay Golf Course just minutes from the mainland ferry dock. Outdoor hot tub on deck with water view. In addition we have a great outdoor propane fire pit on the deck to congregate around in the evening. Such a wonderful home on the water! We thoroughly enjoyed this home! So many great things to say about it!! It is right on the water- we used the kayaks and paddle boards DAILY!! Loved the hot tub also- and it was clean and worked great! The home itself has been updated - beds were great and linens so soft! Bathrooms very nice as well. Also -I am a fuzzy blanket person, and often feel like VRBOs don’t have enough blankets available- this home had so many super soft blankets!! The home was clean and well appointed! Overall-this home was wonderful! We would absolutely recommend it and would stay again for sure! A wonderful home base for just enjoying good company and resting. The bedrooms were very comfortable for two couples. The boats were easy to use for enjoying the water and the location was perfect in any weather. I loved the sitting area that felt like sitting on the front porch, but inside! We thoroughly enjoyed our stay in this beach front home. It was extremely clean and comfortable with everything we needed for a great vacation! I would highly recommend this property! Beautiful home with amazing views. Watching the sunset was awesome each night. Kayaks were easily accessible. Locals were extremely friendly and helped us navigate our way to some hiking trails. The cafe is great. Would definitely go again. We thoroughly enjoyed staying at the beach house. We look forward to coming back. First of all..We loved the beach. We loved the view. We loved using the kayaks and paddle boards. The decks on the house are wonderful. We enjoyed the outdoor gas fireplace and BBQ. The hot tub was really nice. We enjoyed all the big screen TV`s. The kitchen was well equipped. Our favorite was the ultra comfortable beds. We did not want to get out of bed in the morning. The beach house was a wonderful experience. Thanks so much for your wonderful feedback, Chuck! We’re glad you and family had a great time. We look forward to hosting you for a future getaway. Most relaxing week all year. This lovely house on Oro bay is everything the pictures and description make it out to be. Our family had a wonderful 4 day vacation. Everyday was spent paddle boarding, kayaking and dining on the deck. We sighted harbor seals, cormorants and bald eagles daily. One day we paddled over to Jacob's Point park, pulled the kayaks up on the beach and hiked the 1.5 mile, well groomed, Homestead trail. Each evening we ended around the fire pit chatting and enjoying the peaceful sound of the water. The house itself is immaculate and stylishly yet comfortably furnished. We had everything we needed. The views from every room facing the bay are incredible. I can honestly say our stay at this Anderson Island home was one of our favorite VRBO experiences. It was everything our family needed to end the summer refreshed, reconnected and ready for all the hectic activity that Fall brings for school aged families. We are already looking at when we can come back next summer. Thank you Betty and Donn! Anderson Island is the southernmost island in the Puget Sound. Just under 8 square miles. You'll feel very secluded but there's lots to do on the island. Farmer's market on island at Johnson Farm (Saturdays 10am- 1pm) and Steilacoom (mainland) on Wednesdays 4:30pm-6:30 pm, Historical museum, winery tours, trail and beach hikes, all sorts of water activities, golf, tennis, fresh and saltwater fishing, fresh and saltwater swimming. You'll see eagles, deer, seals, otter and heron. If you're lucky you'll see the orcas that frequently visit the south Puget Sound. Explore the island parks and preserves or just relax at the beach house. You'll find everything you need for a romantic weekend to a full family vacation.